You like Puerta Vallarta? I love Mexico period. Which is good, cause we are becoming more Mexico all the time. Good people. Great way to live. Pretty places. The best food and the worst music in the world. Well, you ever go to Puerta Vallarta, look up Don Martin. Apparently rolls cigars in a booth in the mercado or some such. I am shy of the full story. All I know, a buddy of mine came back from Puerta Vallarta with a Don Martin corona in a baggie for me. Left it off with Bearswatter, so I did not have a chance to get details from him. Buddy said the feller rolled it right in front of him. I burnt it last night. Definitely green. Definitely worth getting a bundle and aging them. I think they might turn into good sticks. Firm construction throughout. The cap was as flat as flat can be. The edges of this cap did not come over the sides even to speak of. Consequently, when I cut the cap, a wad of wrapper came out where the wrapper had been folded over. Not a problem; just odd. Good draw. Mulchy unlit aroma in the foot. Hint of spice in the unlit draw. I sat there rolling it round in my mouth for a few. The wrapper had a sour taste to it. Kind of a horehound thing. One half a match fired it right up. Fair volume of thick smoke. 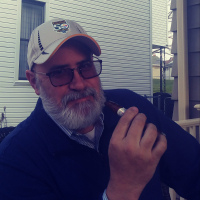 The flavor was right dead on for my first cigars I rolled from a sampler pack I scored at whole leaf tobacco -- dom seco and dom ligero filler, with habano viso wrapper. I rolled those cigars way too wet. Had to leave them age six months before they were worth trying. I still have a few of the knobbly stinkers. Back to the flavor, though: Zero bite, rich tobacco, hint of a zing. Oily hanging smoke. White ash. Super nice stinkfinger sort of a sausage cooking smell. Mellow morning mouth good with coffee. This corona burnt about fifty minutes before it got soggy and went out. I do believe that time would turn them moody and mellow. So, if you're ever in Puerta Vallarta, I'll front you the money to score me a bundle. That looks like a nicely-made cigar, indeed. Enjoyed reading your blurb on it, too. You have an easy writing style that's fun to read. Made me want to book a flight to Puerto Vallarta and hunt up some Don Martins.